For many older adults, retirement frees up time to travel, perhaps exploring places and sights long included on a bucket list. Or retirees plan visits with adult children who have relocated across the country. But for some seniors, travel is not that simple. Those with medical problems, physical limitations, or dementia or other cognitive illnesses face some challenges if they want or need to hit the road. You may have your heart set on going to a family reunion hundreds of miles away or attending a grandchild’s wedding on the opposite coast. Driving may be out of the question, but flying presents its own problems. You’ll have to get through a security line with a carry-on bag, or rush through the airport to transfer flights. You may have a wheelchair or oxygen to contend with. If you or a loved one has health issues or concerns about not being up for the rigors of travel, hiring a medical or other travel companion service is one route to consider. 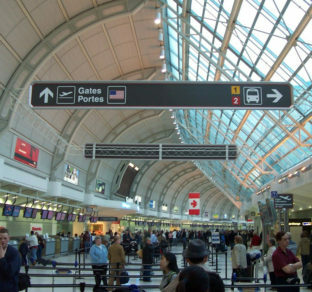 These firms ensure that older parents or loved ones navigate the airport, are comfortable on a flight, and arrive safely at their destination. Some services also will assist in arranging for a caregiver to help out during the entire visit. “The family shouldn’t have to worry about getting grandma to the bathroom in the middle of the wedding,” said Cindy Schaefer, a registered nurse and owner of Travel Care and Logistics, a medical companion flying service. Flying Companions (flyingcompanions.com) provides door-to-door service for seniors traveling alone or those in need of an extra helping hand, according to owner Doug Iannelli. A companion will drive an older adult to the airport, help get through security, sit beside him on a flight, and drive him to his destination. Fees for domestic travel range from $3,000 to $5,000 or more, depending on the number of flight transfers and trip length. Laura Swicker Barber, age 55, used Flying Companions to help bring her wife, who is in the early stages of dementia, from St. Augustine, Fla. to an assisted-living community in Westfield, N.J. Iannelli joined the two on the trip, calling ahead for a wheelchair and securing the last three adjacent seats on a flight. He took care of all the baggage and the rental car. Then he unloaded the bags at the assisted-living community and helped her check in. “There’s no way I could have done this alone and maintained her dignity,” Barber said. Flying Companions does not provide medical care. If you or a loved one requires medical help, be sure to ask a service upfront if it’s available. Travel Care and Logistics (yourflightnurse.com), for example, is staffed by registered nurses who evaluate a traveler’s condition and consult with a physician before a trip. Staff can dispense medicine and handle medical emergencies. Travel Care and Logistics recently helped a woman in her 70s diagnosed with dementia to fly from Washington state to a favorite niece’s graduation at Emory University in Atlanta. The company also arranged for a caregiver to stay with her for the five-day event. Costs, which are based on trip lengths and physical and medical needs, start at about $2,500. Other flying companion services include Travel Helpers (gotravelhelpers.com) and FirstLight Home Care (firstlighthomecare.com). © 2018 The Kiplinger Washington Editors, Inc. Distributed by Tribune Content Agency, LLC.